If you think about it, our feet bear the weight of our bodies all day long. It’s no wonder that at the end of the day, they can be tired and achy. 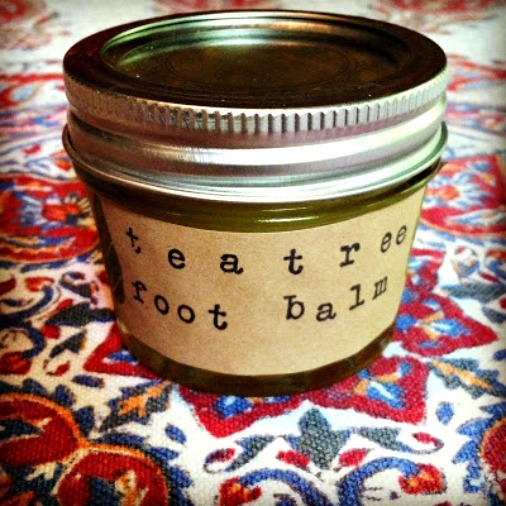 Shannon has created a wonderful Tea Tree foot balm that is all-natural. It softens, relaxes and deodorizes those tired tootsies so they’re ready to carry you through another day. I wanted to share the properties of some of the key ingredients. Shea Butter has been used for centuries in Africa due to its healing and moisturizing properties. It’s especially useful in protecting the skin. Shea butter is loaded with vitamins (A,E & F) and minerals. Tea Tree Essential Oil has all sorts of beneficial properties for the skin: antibacterial, analgesic, antifungal, anti-inflammatory, antimicrobial, deodorant and more! Jojoba Oil is often used as a carrier oil. But did you know it’s not really an oil? It’s actually a liquid plant wax. It’s wonderful for skin product recipes because it absorbs moisture in the same way that our skin absorbs moisture. Calendula has been often used in oils, salves and balms to promote healthy skin. In this article, Shannon explains how to prepare the Shea butter. It has to be held within a certain temperature range for a specific amount of time, but Shannon provides an easy way to accomplish this. She also gives clear directions on preparing the other ingredients and combining them all into the final foot balm. I think the best way to use a foot balm is to first take a nice warm bath. Then slather the balm on your feet and pull on some clean old cotton socks. Keep the socks on all night. You’ll have “happy feet” in the morning! Visit the How to Make Homemade Tea Tree Foot Balm link belowto see the complete recipe..